Contact us today to set up a cultural program ! 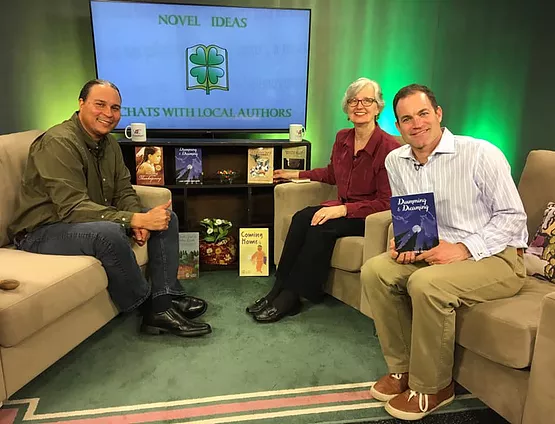 LARRY SPOTTED CROW MANN was recently a guest on the Novel Ideas Show. 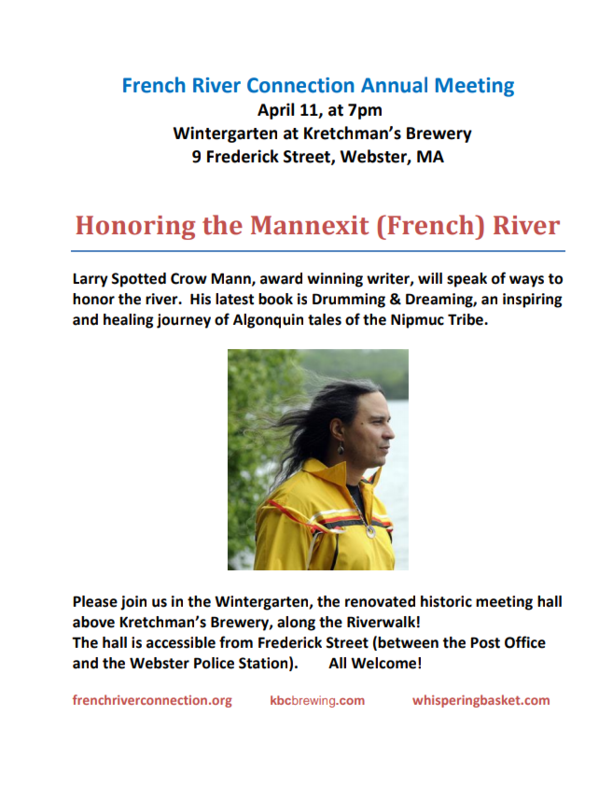 He enlightened us on the history of the Nipmuc Nation, and his own path to finding his identity. His books: Drumming and Dreaming, the Mourning Road to Thanksgiving and Whispering Basket are filled with tales, poems and wonderful truisms, such as, "We don't have a choice in our ethnic background or the color of our skin, but as human beings we do have a choice in how we interact with one another . "We were so honored to have Larry share his life purpose of fighting for social justice issues for indigenous people. He delighted us with a song on his ancient drum. During the month of March 2019, Mann had the opportunity to share a cultural program with the students of Fayerweather Street School. 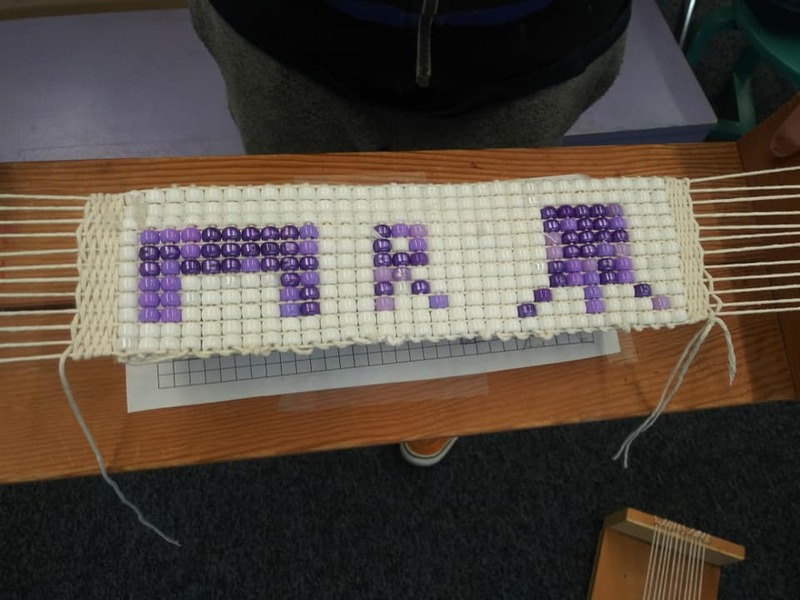 Some of that presentation included learning the ancient and sacred purpose of Wampum. Part of their assignment was to talk with an elder or grandparent and learn a family story. 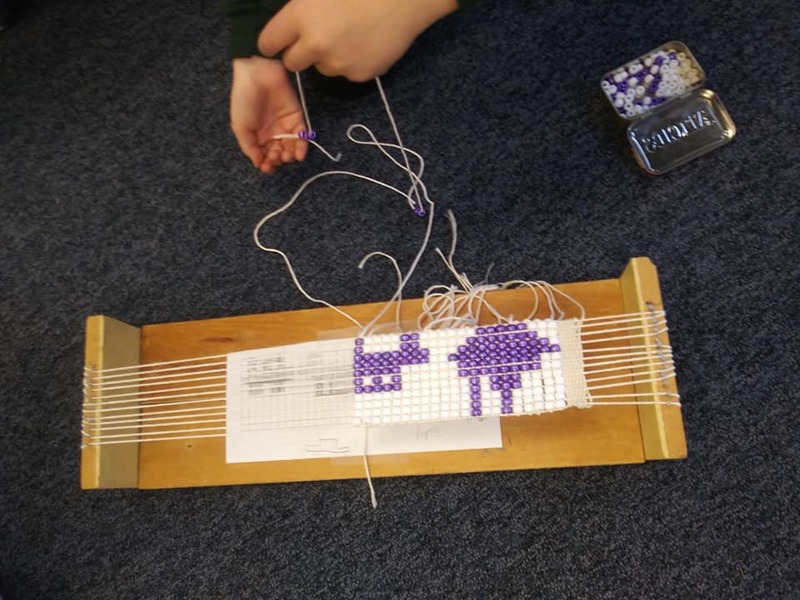 Then re-share that information by making their own wampum story. The youth did a superb job! A Spiritual Reflection of Mann’s work by Pastor Kent Harrop of The First Baptist Church of Beverly Massachusetts. Read The Story Here. 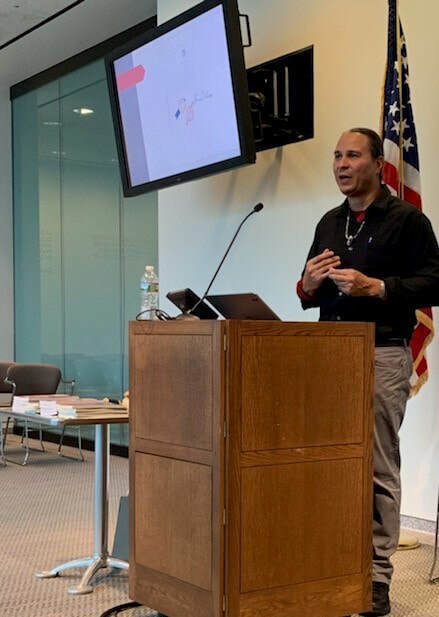 Mann Speaking before the Federal Judiciary and staff in Boston on issues and concerns of Native Americans of Massachusetts. 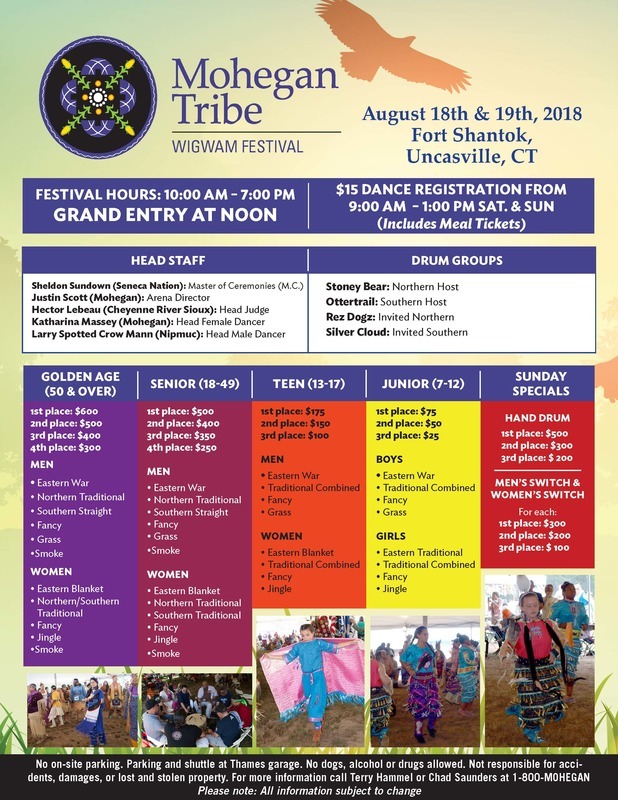 Mann, along with other grass roots tribal leaders partnered with MASS DPH for over six year now: to focus on Native traditional practices, stories, images, dances, and connections to bear on the development of youth to help ensure a positive future. One of the Team’s goals is to decrease the substance misuse disparities of Native youth in Massachusetts. The Circle Tied to Mother Earth is a reflection of such work. 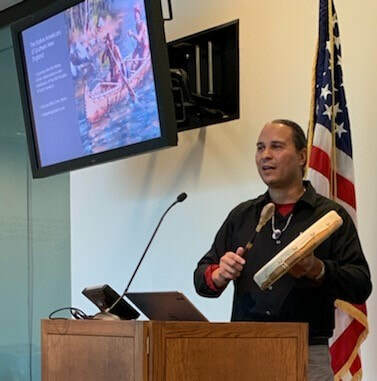 Several traditional stories were taken from Mann’s new book, Drumming & Dreaming as a way to combine Ancient stories and healing Ways of the past and apply them to the current issues, such as substance abuse, depression and low self-esteem. These Traditional Legends and stories help connect youth to Place, instill cultural pride and build a sense of community connection to the past and helps create a positive image for the future. Featuring drumming, storytelling, culture and history. 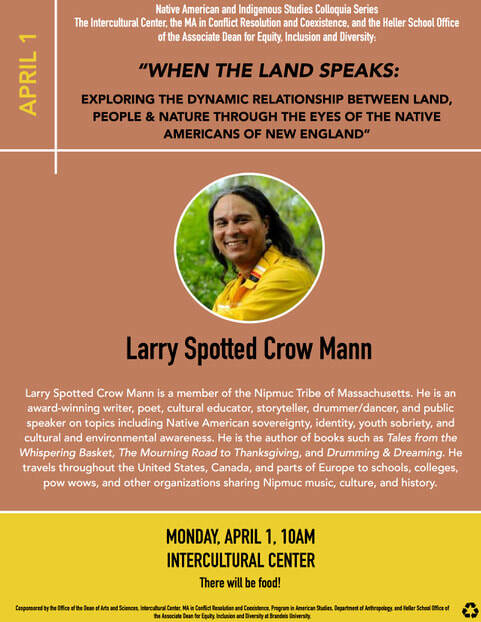 Larry Spotted Crow Mann is a member of the Nipmuc Tribe of Massachusetts. He is an award-winning writer, poet, cultural educator, Traditional Story Teller, Tribal Drummer/Dancer and Motivational speaker involving youth sobriety and cultural and environmental awareness. He travels throughout the United States, Canada and parts of Europe to schools, colleges, pow wows and other organizations. 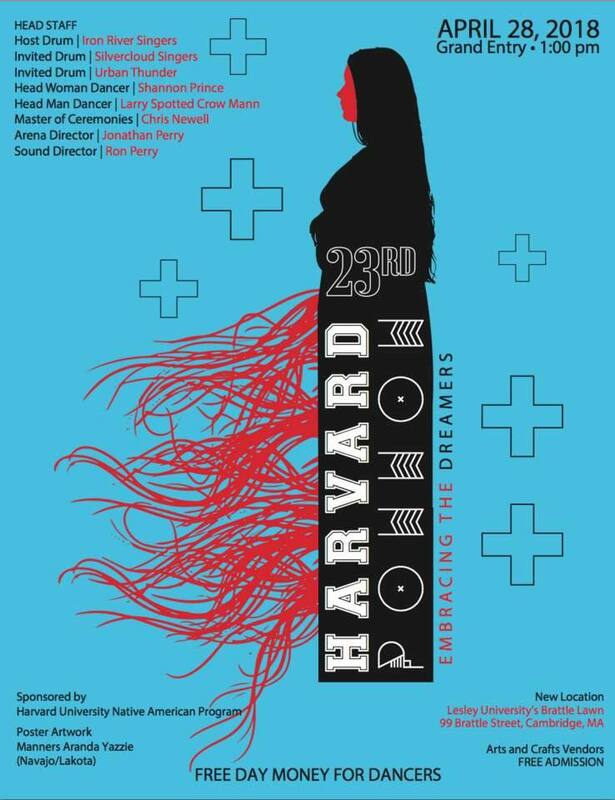 Keep an eye out for this dynamic and exciting new presentation coming this October at the Harvard Peabody Museum! What a Stellar, time we had tonight at our Mars, Stars & Storytelling Event! Our Indigenous ancestors orientated their lives, spirituality and connection to the world by meticulous observation of the heavens. The ancient legends we share aligned our existence and ceremony to the movements of the universe. ​Very grateful our Nipmuc people had the opportunity tonight to observe the celestial heavens and listen to some of the old stories. Thank you very much, Geoff Mclean from NASA; also known as the ‘Star Dad,’ for sharing your time with our community. Thank you to all the people who came out. Thank you for not only helping to carry equipment, but also brave some of the most ferocious and Jurassic mosquitos of all the north east. It was indeed well worth a few bites to get to a spectacular view of Mars, the Moon, Saturn, M51 and Jupiter and its four Galilean moons. Wicked cool stuff tonight! Once again, thank you all for coming out and thank you Gedakina for supporting these tribal events! JEMS to host Native American event June 16! On December 5 , 2015, Mann was awarded the 2015 WordCraft Circle of Honors Winner, YA category for his bestselling novel: The Mourning Road to Thanksgiving. 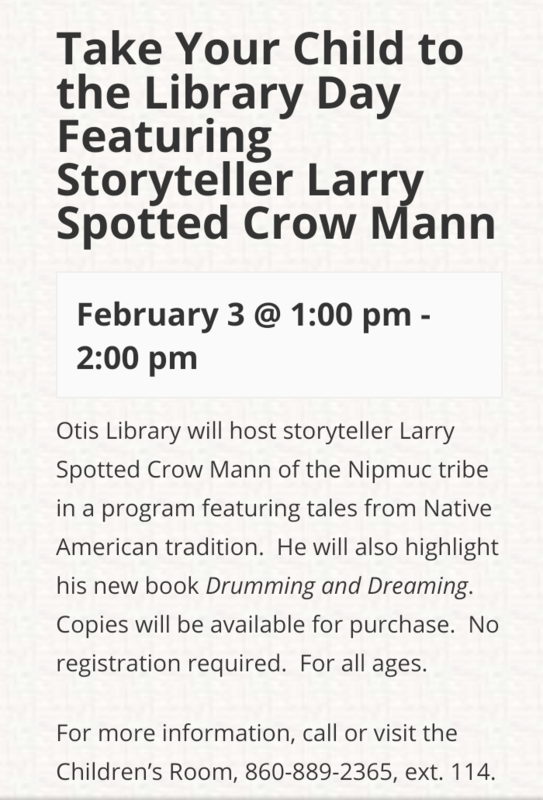 This event was part of the Returning the Gift annual festival of Native American Writers , Storytellers and Poets. The weeklong event of fireside storytelling , workshops , readings and other cultural activities culminated with the awards ceremony and grand feast at the Indian Pueblo Cultural Center in Albuquerque New Mexico. November is Native American Awareness month. And it was a busy month for Mann. Each month they create posters and or literature that is displayed in universities, workplaces , libraries and other organizations that showcase and highlight the respective culture. 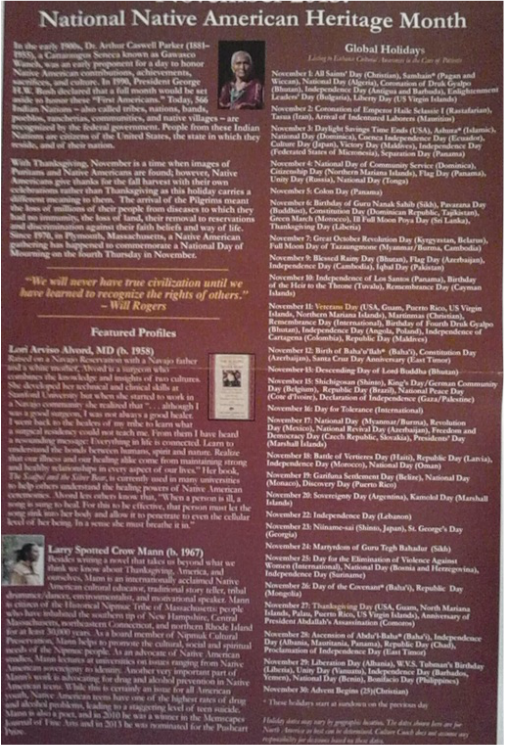 For Native American Awareness Month Mann was one of the featured artist to be selected. Also a Powwow presentation for the students of the Grafton Jobcorps. Mann was accompanied by several members of the Nipmuc Tribe as well as representatives from the Mohegan Tribe to give the students and staff at Grafton Jobcorps a fun filled night of drumming , dancing , Native Storytelling , traditional games followed by a Native American dinner especially prepared for the event. The director of the Grafton Jobcorps; Miss Colleen Lanza took the event one step further. She purchased over 200 copies of The Mourning Road to Thanksgiving to give to the students to help share the voice , history and a culture of Native American people in dynamic way. 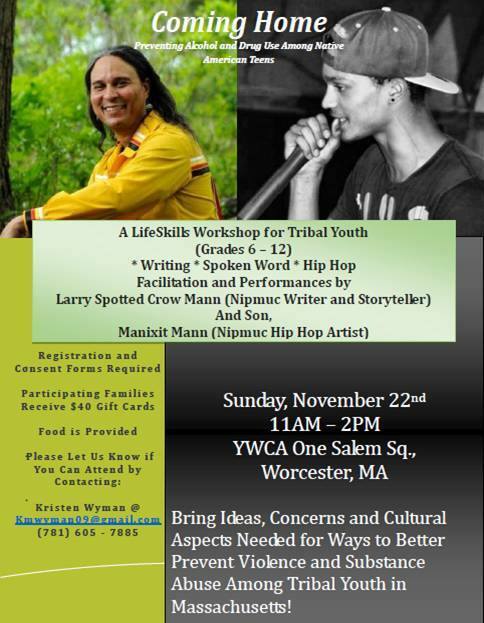 Other November programs included a Native American Youth Writing workshop and spoken word presentation. Mann was accompanied by his eldest son Manixit Mann who is also a traditional singer and Hip hop artist. The emphasis of the workshop was on creative writing, using Hip-hop for positive self-expression, tapping into Native traditional storytelling and using literature for the prevention of alcohol and drugs. Barnes & Noble in the Blackstone Valley Shoppes in Millbury Massachusetts. Located in a wonderful mall of shops, restaurant's and theaters. Bring the whole family, enjoy the afternoon and make sure you stop by Barnes & Noble at 6pm! For more info ﻿click here﻿. Ogitchida Kwe’s Book Blog, Will be hosting The Mourning Road to Thanksgiving- Book Blitz Giveaway! Live, January 16th 2015! Stay tuned and follow link for your chance to win a Free Book! the honored dancers for the New England Black Wolves Lacrosse Team Game Opener at the Mohegan Sun Arena. “It’s truly an honor to have our traditional game back in New England, and to dance for all my ancestors. 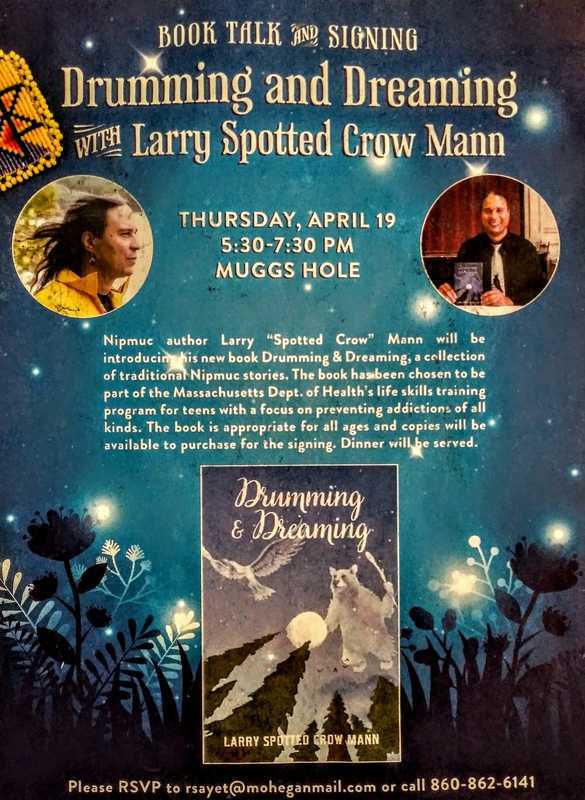 Thank You to the Mohegan Tribe for inviting me to be part of this special event.” -Larry Spotted Crow Mann. Watch the amazing video here! Tuesday, 11: AM, November 4, 2014. Kennedy Conference Room at Massachusetts College of Art & Design. Wednesday, November 5th, 2014 at 7:00pm. Forest County Potawatomi Cultural Center, Crandon, WI. November 12th, 2014 at 10am and 1pm.